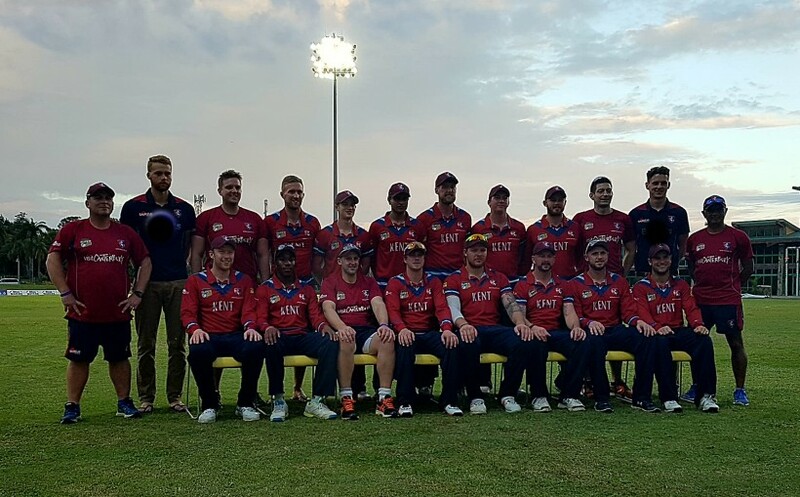 Calum Haggett hit his career-best List A score and Hugh Bernard struck on his county one-day debut as Kent lost to hosts Leeward Islands Hurricanes in Antigua. The hosts invited the tourists to bat at a picturesque Coolidge Cricket Ground with regular wickets falling before resistance from Haggett (45), Adam Rouse (35) and a cameo from Adam Riley (21*) helped Kent reach 234 for nine. Daniel Bell-Drummond was the first to go, trapped LBW by Test paceman Alzarri Joseph to a ball that kept low. The introduction of the veteran Gavin Tonge proved crucial as Dickson and Northeast were caught off his bowling as batsmen tried to adapt to the two-paced surface. Tonge was the pick of the home attack with 4/39 and off-spinner Rahkeem Cornwall took 2/35 in ten tidy overs – removing Darren Stevens LBW and Alex Blake caught behind. Calum Haggett was the anchor of the innings as he shared a stand of 44 with Rouse and 52 with Coles as Kent recovered from 85 for five to post a competitive total. A couple of cameos from List A debutant Imran Qayyum and a career-best unbeaten 21 from Adam Riley gave Kent a boost in the latter overs. In reply, the Hurricanes started strongly and kept wickets in hand to accelerate towards the victory target of 229 after a five-run penalty for running on the wicket. Leewards openers shared a stand of 53 for the first wicket followed by partnerships of 38 and 64 as the batsmen approached the chase patiently. Skipper Sam Northeast employed two spinners with Riley (2/41) and Qayyum operating as James Tredwell nursed a bruised hand. Bernard bowled with good control and was rewarded with the scalp of former West Indies batsman Kieran Powell, caught at long on by Adam Riley. Kent XI: Bell-Drummond, Dickson, Northeast (c), Stevens, Blake, Rouse (w), Coles, Haggett, Riley, Bernard, Qayyum. Leewards XI: Hodge, Powell (c), Bonner, Hughes, Hamilton (w), Cooper, Hosein, Cornwall, Peters, Joseph, Tonge.